When Drew Collins (Bradley) was just a child, he was in a plane that crashed in Japan. Like what would happen to anyone in that situation, he was then raised in the ways of the Samurai by a Japanese Master, Sanga (Fujoika). After reaching the highest levels of Samurai school, Master Sanga bestows upon him the treasured family sword. However, his son from birth, Kenjiro Sanga (Dacascos) feels anger, betrayal and resentment about that fact. So much so, he joins the Yakuza. Later on, Drew becomes a reporter in L.A. He ends up traveling to Istanbul with Janet (Trapp) for an assignment - at first they don’t get along and then they end up in a relationship! - but naturally Drew gets roped into illegal, underground “live blade fighting”, and guess who the reigning champ is - none other than Kenjiro. So now the two half-brothers must face off in the ultimate duel to the death: the honor of the Samurai vs. the evil of the Yakuza. Who will slice and dice their way to the truth? In American Ninjas 3, 4, and 5, David Bradley was the American Ninja. Now, he’s the American Samurai. We know Cannon recycles plot ideas all the time, but come on. A transparent word change from one well-known aspect of Japanese culture to another is pretty obvious. But what this movie really is, is practically a remake of Bloodsport. Even the DVD touts the fact that “It’s Bloodsport with blades!” There’s even an amazing facsimile of that movie's Donald Gibb character in Harrison (Ryon). But there are plenty of meatheads with weapons on display, and many of them seem to take on well-known personas. For example, there’s a guy who’s strongly reminiscent of Conan the Barbarian (1982), and Harrison resembles Indiana Jones (and his name is Harrison...coincidence?). The situation is sort of a cross between Ring of Steel (1994), Best of the Best 2 (1993), and Bloodsport (1988). Dacascos puts in an energetic performance as the angry brother, and Trapp is decent as your classic reporter who bickers with Collins and then inevitably falls in love with him. She even calls him “Samurai Hunk.” Ugh. But a lesser-known fan favorite gets a pretty decent “slice” of the action here - Ron Vreeken, of Hurricane Smith (1992), Rage and Honor II (1993), Deathfight (1994), and Under the Gun (1995) fame. He looks extra-meatheady, and we mean that as a compliment (? ), but then again, it’s hard not to when you wear a wrestling singlet for the entirety of the movie and you have long blonde hair. But it is nice of the “Arena” captors to provide their fighters with their own weight room. Sadly, American Samurai is the victim of overly-PC editing. By that we mean, in days gone by, during the death and dismemberment scenes (which are undoubtedly the highlights) they would either show the blood or perhaps gore, or release the movie in two versions: cut or uncut. In the PC 90’s, they just released a jaggedly cut version. The Swedish DVD is uncut, but extremely hard to find. It’s a real shame. In the DVD era, American fans should be given what they want. There’s no excuse for it, and the only “cuts” we should be seeing are the ones administered by David Bradley and Ron Vreeken! 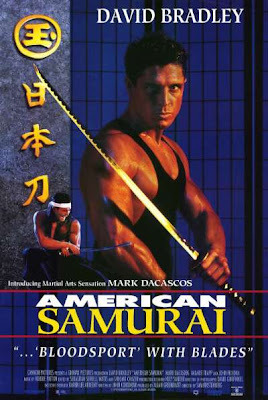 Perhaps interestingly, “American Samurai” is an alternate title for Paper Bullets (2000), and “American Samurai 2” is what the Jerry Trimble outing Live By the Fist (1993) is called in Germany. 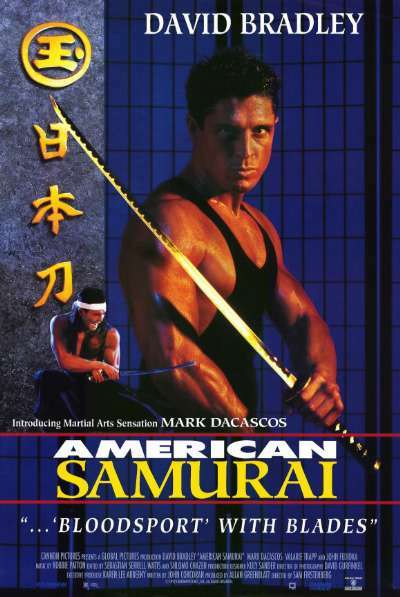 It all gets very confusing, but all you really need to remember is that this American Samurai is yet another underground fighting movie that is okay, not bad, but could have used a tad bit more originality. Also check out write-ups from our buddies The Video Vacuum and DTVC! I bought the swedish dvd for like nothing but I still haven't watched it yet. From what I remembered from when I saw it back in the days I liked it...but that has probably changed then....but thanks for the reminder! No problem! Dacascos as the villain was solid, but Bradley was just ok...should have switched roles. Great review guys. I think this was a massive waste of Dacascos' talents. Some of the fights were cool, but you just had to wait forever for them. Thanks for the plug too! Thanks! Totally agree with your comment too. This was pretty weak except the fights and some of those were terribly edited for violence. Would love to see an uncut version. When the movie played on Showtime back in the 90s, all the gore and splatter was intact. I was pretty excited to get a hold of the VHS tape after that only to find it was missing pretty much all the graphic violence. Ditto the US DVD, too. Judging by the editing and numerous close ups during the last fight, Dacascos and Bradley's last fight seems to have been cut short, or was never finished; You can see the red sash of the bald Chinese fighter's sword in a couple of shots. Firstenburg also did a few Cyborg Cop movies, I think was the name of them. I wouldn't mind seeing those again, too. That is interesting that Showtime played the uncut version. The editing of the violence is very obvious in the last fight....It should have been like the unrated Shootfighter. Haven't seen the Cyborg Cop movies in a long time. Remember those weren't bad. Hmm, not sure if that is the uncut version. Nice review. I can't watch Dacascos without expecting him to randomly say A LA CUISINE... even when it predates his rise to power as the chairman's nephew. REGARDLESS, he always manages to put forward a solid performance, sounds like this is no exception. Kev D.: Thanks for your comment! Haha, he was great on Iron Chef. Venom: Very interesting comparison...hate the hack job the U.S. version has. Oh man this one sounds lame! Much like Firstenberg and Bradley's Cyborg Cop, this one looks to also severely disappoint. Thanks for the warning! Awesome review! No problem! We happy to help you avoid this one. Poor Dascascos. Thanks for the nice words.